Song of Solomon is a wonderful book! It has great advice on relationships! It also shows Christ’s love towards his bride. We are His and He is ours! 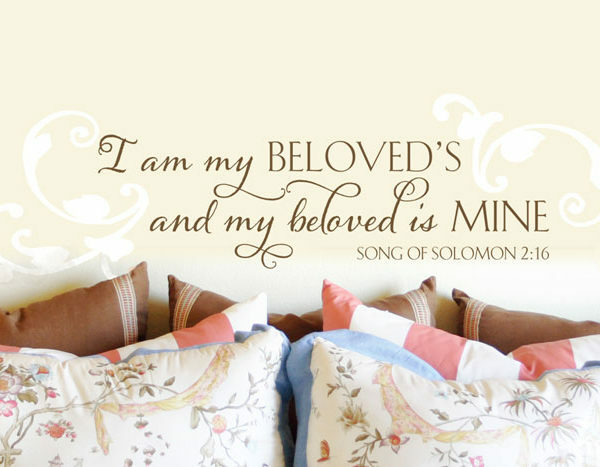 ‘I am my Beloved’s and my beloved is Mine- Song of Solomon 2:16’ wall decals are beautiful words to live by! They look amazing on this wall. The two colored wall letters and romantic swirls above the bed tie in with the fluffy pillows, duvet, and the wall color. The end result is a cozy room with wall quotes that are the truth! Are you looking for wall quotes to decorate your bedroom? 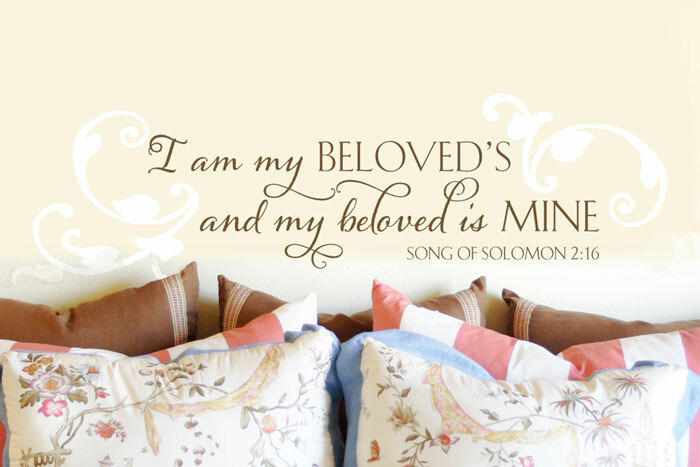 At DecorativeLettering we have scripture based wall words that will look good in your room. They are affordable, durable and easy to apply. The finished look is amazing: they look like they were painted on to the wall! You can be assured that they will last a long time. This is because they are made from resin and can resist extreme temperatures: hot and cold! If your room is well lit, opt for our matte wall lettering. There will be no glare, and will therefore be easy to see and read. We have an excellent team of talented designers that will deliver a quality product that you will enjoy for a long time. They will also answer any questions you have regarding your order. Call or email: we would love to hear from you!